see also "Self-introduction for candidates"
Major interests are to understand how determinants on plant community structures change spatio-temporally (Tsuyuzaki 1995). The keywords of my interests are: succession, community dynamics and disturbance. To understand these, I have surveyed mostly in disturbed areas, including volcanoes, wetlands, forests and skislopes. These ecosystems are suitable for clarifying the mechanisms on plant community structure and function, because the ecosystems are relatively simple and the environmental factors are detectable. I am trying to make a comprehensive model that can describe all successional sere from early to late stages of succession. Here I summarize "I hyave a dream ... " on my researches in the figure. You will understand what I did in a blink when you see the figure in PDF. My major researches have been conducted on Mount Usu (42°32'N, 140°50'E, 727 m elevation), northern Japan, which erupted in 1977 and 1978 and in 2000. The vegetation dynamics is monitored by permanent plots after the 1977 and 2000 eruptions to the present after. These eruptions destroyed the pre-eruption vegetation by thick accumulations of ash and pumice. Most species establishing on the summit area were derived from vegetative reproduction, which played a major role on increases in cover (Tsuyuzaki 1991), throughout the volcanic deposits (Tsuyuzaki 1987). Therefore, the dominant species were large perennials in the early stages of succession. Although wind-dispersal woody species, such as willows and birches, immigrated to the crater basin, their cover increase was slow because of low nutrients and high mammalian herbivores (Haruki & Tsuyuzaki 2001). Thereafter, the fates of perennials were dependent on the rhizome and/or stolon systems. Erosion developed gullies where the former topsoil was exposed. Most annuals were supplied from the seedbank in the topsoil. These indicated that the plant source greatly determines the species composition of establishing vegetation (Tsuyuzaki 1989). Seed extraction method is imporoved to collect seeds quickly with high recovery rate (Tsuyuzaki 1994). Using the flotation and germination tests, the survial of buried seeds were examined. Many seedlings emerged from the topsoil (Tsuyuzaki 1994). The seeds have survived more than 30 years under thick tephra (Tsuyuzaki 2010). Most annuals originated from the seedbank but diminished a few years later. The nitrogen-fixing and stoloniferous perennials, Trifolium repens and Lotus corniculatus var. japonicus, were derived only from the seedbank, and have gradually increased in cover. The seedbank was the major source of annuals and of nitrogen-fixing perennials. Succession in the gullies was substantially different from that which occurred outside the gullies where plants mostly originated from seed immigration and vegetative reproduction from surviving plants (Tsuyuzaki 2009). Ephemeral annuals and well-rooted perennials were successful. Depending on the expansion of once-established perennials, the plant cover was increasing acorss time. Ground surface movements strongly restricted increases in plant cover and the distance from source vegetation was the principal determinant of plant density (Tsuyuzaki & del Moral 1994). Along the disturbance gradient, the successional rates were high on the stable substrates outside gullies and low on the exposed original topsoil. The analyses of species diversity evaluated by density and cover supported the results (Tsuyuzaki 1991). The vegetation data 6 years after the eruption were compared between Mount Usu and MSH. The resembled vegetation was developed in the similarly-disturbed areas even in the geographically distinct regions (Tsuyuzaki & del Moral 1995). The vegetation development was restricted by gully development, due mostly to ground surface instability (Tsuyuzaki & Titus 1996). Although seedling establishment was restricted by ground surface instability, texture and microtopography, the seedling growth seemed to be restricted by the texture of volcanic deposits, i.e., they could not penetrate their roots into silt particles (Tsuyuzaki et al 1997). I had chances to observe Mts Ruapehu, Tarawera, and others located in North Island, NZ, and Mt Pinatubo in the Philippines. 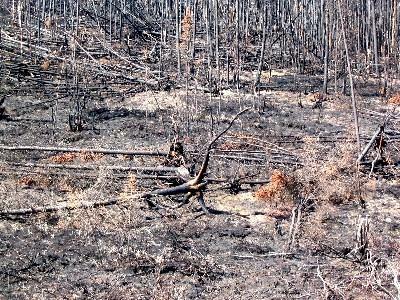 Forests dominated by Picea mariana were burned by the 2004 wildfire (Boundary Fire). To monitor the vegetation recovery, permanent plots were established near Fairbanks, AK, in 2005. Albedo does not recover until the plant cover on the ground surface recovers (Tsuyuzaki et al 2009). The vegetation was recovered by vegetative reproduction when the fire intensity was low while it was by seed reproduction when the intensity was high (Tsuyuzaki et al. 2013). The tree reneneration patterns was altered due to the immigration of deciduous trees that estalblihsed on the burned ground surfaces (Tsuyuzaki et al. 2014). Based on these researches, loss and recovery of Sphagnum through wildfire determine the revegetation and succession. This means that wildfire in Alaska is critical to determine the ecosystem structures not only in taiga but also tundra. We began researches in tundra for detecting the effects of peat fire on tundra ecosystems. To understand the effects of tundra fire and the resultant thermokarst on revegetation, vegetation and related environmental factors were compared between burned and unburned areas of Seward Peninsula, Alaska. Seven vegetation types were categorized along a fire-severity gradient from none to severe fire intensity. The species richness and diversity were higher in intermediately disturbed plots. Severe fire allowed the immigration of fire-favored species (e.g., Epilobium angustifolium, Ceratodon purpureus) and decreased or did not change the species diversity, indicating that species replacement occurred within the severely burned site. Although thermokarsts (ground subsidence) broadly occurred on burned sites, due to thawing, the subsidence weakly influenced vegetation patterns. These results suggest that the fire directly altered the species composition at a landscape scale between the burned and unburned sites and it indirectly altered the plant cover and diversity through the differential modification, such as thermokarst, at a small scale within the burned site (Tsuyuzaki et al. 2018). Somoke-induced seed germination is popular after wildfire in Western Ausutralia. The characteristics of germination is applied to ecosystem restoration. 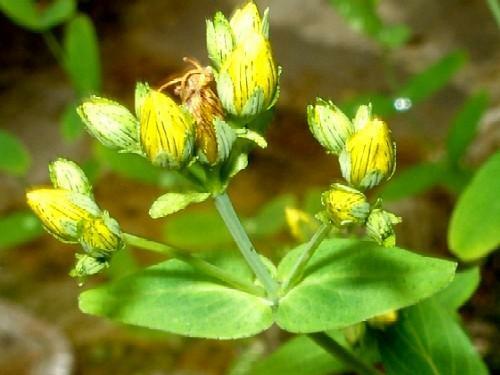 To confirm the potential of Japanese plants, smoke-induced seed germination for 40 species in Hokkaido was examined. Only a few species enhanced germination by smoke, but this does not mean zero (Tsuyuzaki & Miyoshi 2009). I have survyed the following animasl, although these are not always related to disturbances. Ant that is of course animal was also surveyed. Secondary succession often starts after human impacts. To understand the complex mechanisms, I selected post-mining wetlands and mines, skislopes and abandoned pastures. These habitats are altered by land modification, e.g., scrapping off the ground surface, and introduction of exotic grasses. It must be the fates that most plant communities received human impacts, and thus we should not neglect the effects on ecosystems. I surveyed the vegetation of more than 30 skislopes in Japan and a few in USA (Titus & Tsuyuzaki 2003). 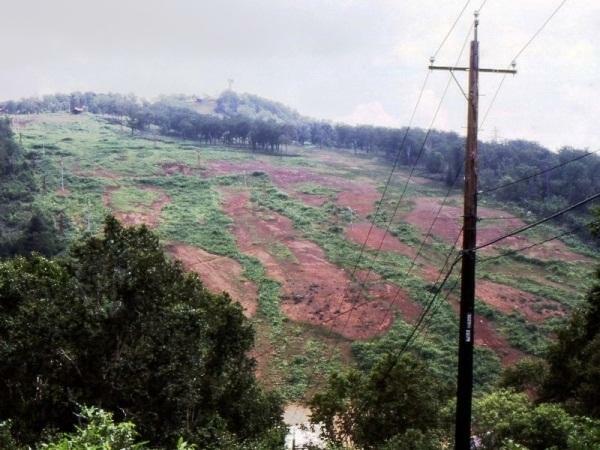 Baregrounds develop soon after the skislope establishment and occasionally persist because of soil erosion (Tsuyuzaki 1990), although artificial seeding was conducted. 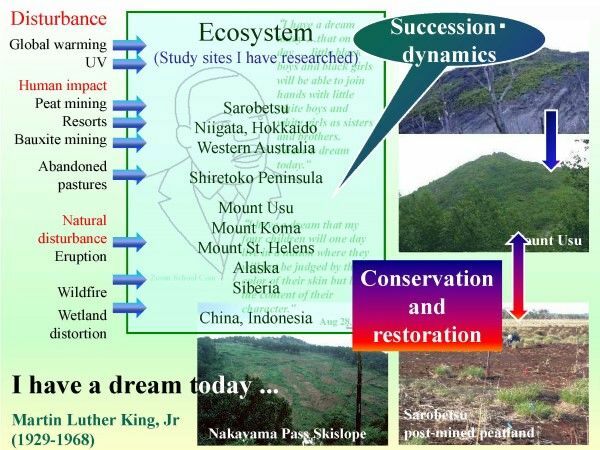 There are two basic successional sere from baregrounds to exotic grasslands and to native grasslands in central Honshu (Tsuyuzaki 1995) and in lowland Hokkaido (Tsuyuzaki 2002). Woody plants invaded well to Miscanthus sinensis grasslands (Tsuyuzaki 2005). The construction of skislopes induces not only natural environmental problems but also social/living problems, and these problems in Japan are summarized (Tsuyuzaki 1994). On Shiretoko Peninsula, northern Hokkaido, the relationship between vegetation and seedbank was investigated. The vegetation development was restricted by thin soil. Small seedbank developed and seemed to contribute the revegetation little, and thus the revegetation slowed (Tsuyuzaki & Kanda 1996). Although coal mining was popular in Hokkaido before 1970s, nearly all coal mines have been closed. To resotre ecosystems on the coal-slag heaps and the other disturbed aeras, we need techniques for the restoration. To learn them, I observed restration after bauxite mining in WA. Now revegetation after peat-mining is researching in Sarobetsu mire. One of the rsearch problems is that many volcanoes, skislopes and wetlands are located in national parks and/or reserves in Japan. Mount Usu is located in Toya-Shikotsu National Park, and skislopes are concentrated in Niseko-Syakotan-Otaru Kaigan Quasi-National Park. To promote forestation after the 1977-78 eruptions on Mount Usu, Picea glehnii was transplanted on the crater basin. However, this species is not distributed in the mountain! Wetlands are one of the crucial ecosystems for keeping biodiversity. In Ruoergai marshland, the largest wetland in China, vegetation zonation was clearly observed along the water table or depth gradient. However, the effects of water table differ between habitats (Tsuyuzaki et al 1990). In low-elevated sites, Carex meyeriana tussocks were well-developed, and the upper parts contributed species diversity (Tsuyuzaki & Tsujii 1992). The vegetation received heavy yak grazing (Tsuyuzaki & Tsujii 1990). The structure of Larix olgensis forest was spontaneous with less seedlings in a western part of Mount Changbai peatland, northeastern China (Tsuyuzaki 1994). In tundra, the effects of various topographhy were measured in relation to permafrost. Palsas increased the species diversity in ANWR (Tsuyuzaki et al. 2008). Baidzharakhs (relic mounds) affect the vegetation zonation (Tsuyuzaki et al. 2010). Gullies developed by melting ice wedges developed specific vegetation (Tsuyuzaki et al. 1999). These imply that topographical diversity increased by permafrost is related to community and landscape diversities. Methane emission patterns were different between vegetation types near Kolyma River (Tsuyuzaki et al. 2001). Additionally, peat-swamp forest in Indonesia was also surveyed with reference to microtopogranphy (Nishimura et al 2007). The Sarobetsu Mire is located in the northern part of Hokkaido. The mire was mined for about 30 years. We are researching the revegetation mechanisms after the peat mining. Firstly, the successional sere was detected (Nishimura et al. 2009). Then, the development of seedbank was detected (Egawa et al. 2009), and was regulated by litter accumulation (Egawa & Tsuyuzaki 2013). The seedling establishment was related to successional changes in environments, i.e., decrease in light and increase in water (Egawa & Tsuyuzaki 2011). The facilitative effects of tussocks were confirmed (Koyama amp; Tsuyuzaki 2012). However the effects was reduced when precipitation was extremely low (Koyama & Tsuyuzaki 2013). 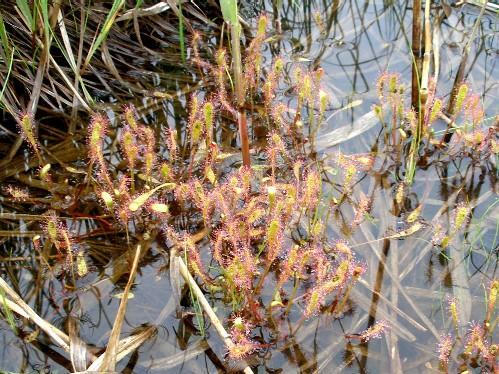 An endangered species, Drosera anglica, establishes in the post-mined peatland. The morphological characteristics of D. anglica were compared to those of common species, D. rotundifolia (Hoyo & Tsuyuzaki 2013). D. anglica allocated the resources more to vegetative reproduction than D. rotundifolia (Hoyo & Tsuyuzaki 2015). In addition, D. anglica was weak to inter-specific competition. Therefore, this species maintain the populations by vegetative reproduction on habitats where the competition was less (Hoyo & Tsuyuzaki 2014).